A genuine competitor to well-established USB keyboard manufacturers - impressive. Impressive array of controllers. Good keyboard action. Generous, creative software bundle. Requires a bit of set up time. Pitch/mod stick may be divisive. Good keyboard action and an impressive control set make the A-800 a serious controller contender. The A-800 is lightweight and easy to transport. Look around the shelves of your nearest technology dealer and you'll see there is no shortage of USB controller keyboards on the market, many offering control sets which stretch way beyond mere note input. Sliders, dials, transport controls for your DAW of choice and pads for alternative note input are now commonplace on the more grown-up models and so this is a very competitive area for any manufacturer to launch a new product into. Unfazed, Roland's new A-800 Pro is here after a previous incarnation as a 'Cakewalk by Roland' controller. That's because in 2008, Roland became the majority shareholders in Cakewalk and decided to brand their controllers as such. However the fact remains that these are Roland keys through and through and work great with any DAW. Hence the (sensible) renaming. A quick scan of the A-800's physical properties will tell you this is a keyboard designed equally for stage and studio. The unit can be bus-powered via its USB port or via a DC power inlet (disappointingly, this is sold separately) and it's extremely light in weight for a 61-key controller, making it an easy instrument to sling in the back of a car en route to a venue, though it's worth noting that models with shorter keyboard lengths are also available. 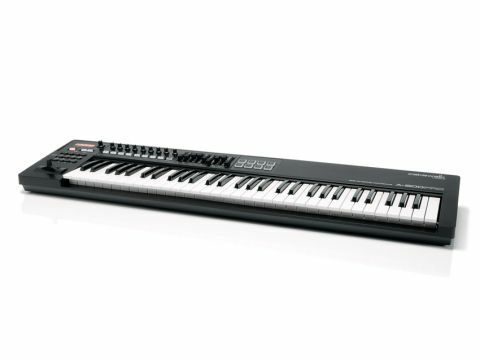 Despite this, the keyboard bears the proud Roland tradition of offering a highly playable keyboard surface with a good action, including velocity and aftertouch control. However, its top panel reveals its true intent as a studio controller, with nine sliders, nine dials, eight 'Dynamic Pads', a full complement of transport controls and a range of keyboard switches to quickly switch octaves, configure keyboard splits and call up preset or user setups. However, the ace in the hole for the A-800 Pro is its compatibility with all of the most popular DAWs available on the marketplace. Integration is achieved having run the bundled driver software (in fact the keyboard won't operate as even a basic USB controller until you've done this), after which preset templates are available for each DAW. Tested on a Mac, the procedure involves some extra work in the Audio/MIDI setup window but everything's clearly explained in the manual and works without hitches. Also bundled with the board is the Production Plus Pack which is a suite of music software including Sonar 8.5 LE and three different virtual instruments - Rapture LE, Cakewalk Sound Center and Studio Instruments Drums, which will either get you up and running or expand your virtual instrument sets accordingly. This is a thorough and worthwhile rival to the USB keyboard controllers already on the market and takes on the M-Audios and Novations of this world by offering DAW control direct from the front panel. There are a few considerations for potential purchasers - Roland's pitch/modulation stick is present here and has divided opinion for a couple of decades now and compared to the instant plug and play nature of some USB keyboards, set up time takes a little longer here. It is worth it in the long run though, as the A-800 Pro plays well and, once integrated, gets your hands away from the mouse more often than you'd imagine. There's never been a better time to get a USB keyboard controller in terms of price versus features and if you're shopping for a new one, a thorough browse and test here is definitely recommended.